" NOMINTION :Best Performance by a Male Dancer - Alisdair Macindoe - Pay No Attention to the Man Behind the Curtain (Alisdair Macindoe)"
Pay No Attention to the Man Behind the Curtain is an experimental reworking of the classic modern fable The Wizard of Oz as a solo dance work, reconstructed through the lens of the American ‘Hearts and Minds’ campaign, a US military strategy developed during the Vietnam War and recently redeployed in the war on Iraq. Pay No Attention to the Man Behind the Curtain considers the common themes across these two very different cultural phenomena: the search for security, courage, mindfulness and love; responses to unforeseen changes; and the actions and consequences of decisions made out of fear, inspiration, severance and isolation. 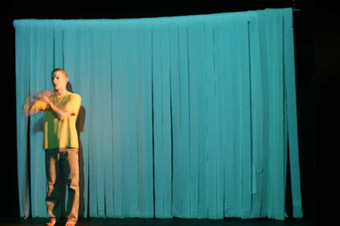 Through a complex system of live video feeds, virtual and actual sets, cutting edge choreography and an evocative soundscape, Pay No Attention to the Man Behind the Curtain is a moving and provocative meditation on the cultural conditions which we live and endorse, probing who is responsible for producing and perpetuating them.